The supratrochlear artery originates from the ophthalmic artery and is the generally bigger concluding branch. It perforates the orbital septum after arising from the ophthalmic artery and also travels in the superior and medial part of the orbit, medial towards the supratrochlear nerve. 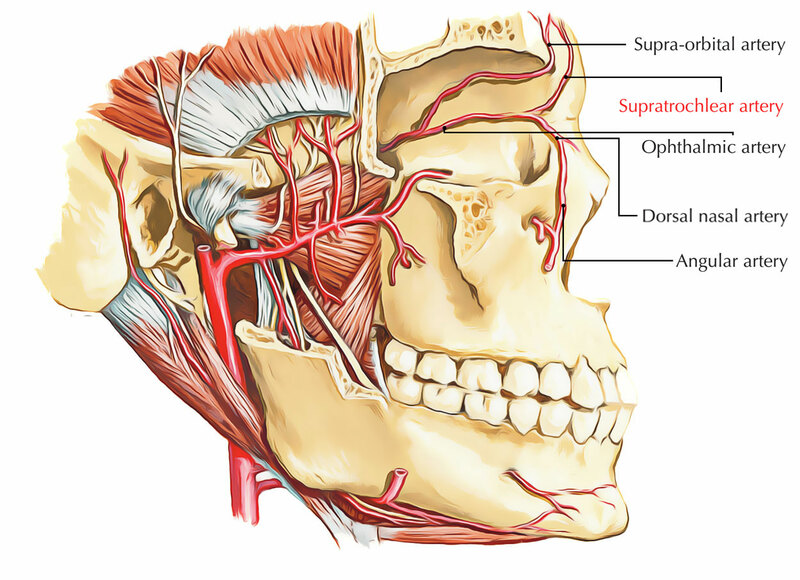 Via the supratrochlear notch that is located medial to the supraorbital notch both the supratrochlear artery as well as nerve exit the orbit and afterwards ascend in order to supply the forehead along with scalp. It supplies the skin, muscles, and scalp close to the midline. This is most certainly the oldest flap in history and has its significance till today. In order to supply the midline forehead up towards the vertex, the artery travels over the medial one-third of the supraorbital rim. It is vital that this vascular pedicle can be dissected in the region of the orbital rim in lifting the forehead flap and spreading it around the medial brow enhances the arc of rotation of the flap. This is mainly important when recreating the nasal tip as well as columella.